Gracie Jiu-Jitsu is an excellent way to learn self-defense, especially from the ground, and to improve your fitness level. It was developed to help a smaller, weaker person to defend against a bigger, stronger opponent. 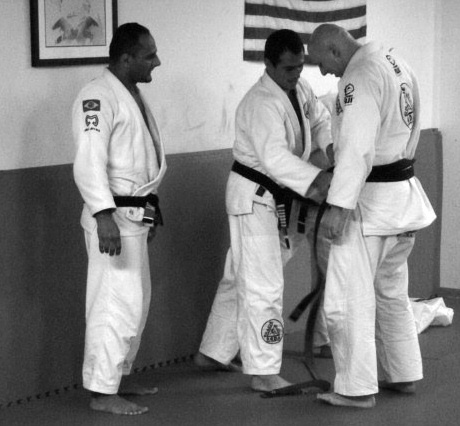 Gracie Jiu-Jitsu concentrates on techniques, which through time on the mat, will help you defend yourself in real-world situations. Here at Gracie NOVA, we want to help you reach your fitness goals, while you’re learning self-defense. No one really has the time today to work on their endurance at one time, their strength at another time, let alone learning something new at yet another time. We have to maximize our time, while having fun doing it. You can do this at Gracie NOVA. Come and have a practical workout that will help you achieve your fitness goals, while you learn how to defend yourself. Continues to cross-train with World Class Coaches, Competitors, and Instructors. Prof. Asher is well-known as a dedicated coach, mentor, and instructor in Jiu-Jitsu. Having trained in Jiu-Jitsu for nearly 20 years, he is not only well-versed in all facets of Gracie Jiu-Jitsu, he is also a well-formed teacher trained in the tradition of the Gracie Family. With an affinity for seeing his students excel, you will never leave a class feeling disappointed. Asher combines the rare ability to be fighter and teacher at the same time. His innate abilities enables him to explain the concepts and principles of Jiu-Jitsu, allowing a student to progress rapidly in the art. Asher is an incredibly dedicated student and instructor of Gracie Jiu-Jitsu. He’s as patient and easy going as he needs to be, and humble enough so that he is always learning. This is what makes him a good instructor. He is constantly learning and training with the best Jiu-Jitsu instructors and competitors in the world, and in turn, brings this knowledge to his students. It is a modern combat system of standing and ground defense techniques utilizing principles of balance and leverage. Train with multiple partners of differing skill levels, and acquire a well-rounded understanding of Gracie Jiu Jitsu and its applications. Increase awareness, physical conditioning, flexibility, and personal effectiveness while releasing stress and improving health through a vigorous aerobic and anaerobic workout. WHY SHOULD I LEARN GRACIE JIU-JITSU? You should learn Gracie Jiu-Jitsu for two main reasons. First, many self-defense situations end up on the ground, and as prudent individuals we should learn how to survive such a situation. Second, since we all need to work on our fitness, why not do it in a setting that is both fun and beneficial. Interested In Trying Out Gracie NOVA? If you’re serious about your training and would like to take it to the next level, find out more! An instructor here at The Fighters Garage once told me that a likely scenario in an attack on a woman would be ending up on the ground, and being forced to fight from there. While I had been learning how to defend myself in the Krav Maga classes, I wanted to go more in depth into self-defense on the ground. So I decided to start taking BJJ classes to improve my ability to survive such an attack, but soon discovered the challenge it provides is addicting. It’s about anticipating your opponent’s moves, knowing your own body mechanics, learning what you can and can’t pull off, properly breathing and thinking through uncomfortable situations and not feeling intimidated in a close-contact physical “fight” with an opponent twice your size. It’s the hardest thing I’ve ever done, and also the most enjoyable. Asher is the most well-rounded martial artist I have ever trained under. Not only is he able to seamlessly integrate principles from a variety of combat systems, but also more importantly, he is able to teach them in a way that is easy to understand and apply. As a Jiu-Jitsu practitioner, it is extremely refreshing to train the art in a manner true to its original roots – a practical system for self-defense. Everyone at The Fighters Garage foster a family atmosphere where all are welcome.